K.B. 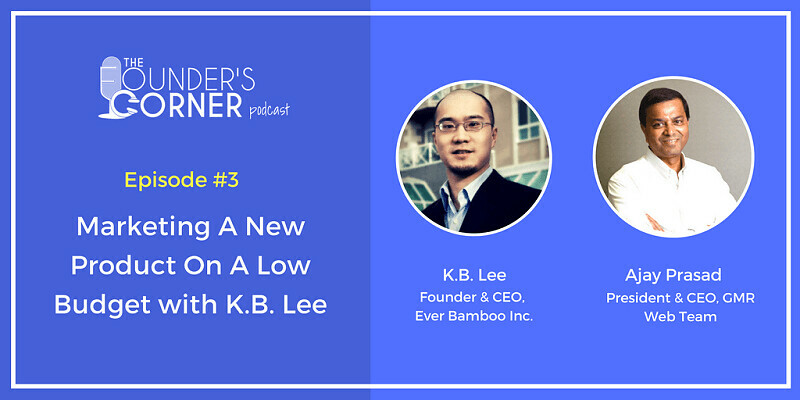 Lee is the owner and founder of the startup company Ever Bamboo, an online and wholesale distributor of bamboo charcoal deodorizers and dehumidifiers. Founded in 2007, this startup got its big break in 2014, when it was featured on The View as one of Whoopi Goldberg’s “Favorite Things”. Casey: Hello and thank you for listening to the Founders Corner. This podcast invites business owners and entrepreneurs to discuss their business challenges and seek advice from our host, Ajay Prasad. Ajay is a serial entrepreneur and owner of two seven-figure web-based businesses, GMR Web Team and GMR Transcription, and the proud creator of the online reputation management software, RepuGen. If you would like to be a guest on our show or contact Ajay personally, please click the link in the episode description. Enjoy the show. Ajay: Thank you for listening to the Founders Corner. I am Ajay Prasad. We have KB Lee as our guest today. KB is the owner of Ever Bamboo Inc., an online and wholesale store for bamboo charcoal deodorizers and dehumidifiers. KB is joining us today to ask us for advice on marketing his unique business. KB, tell me a little bit about you and your business so that my audience knows exactly what you do. KB: Our company is Ever Bamboo, and we have a brand of natural deodorizers and dehumidifiers. They are made of bamboo charcoal. The product comes in different shapes and sizes, and they come in pouches. They work for places like shoes, gym bags, fridge, closets, bathrooms; different types of areas where there are odors and it’s musky. The unique part about the product is that it’s all natural and it’s made of bamboo, and it’s unscented so they don’t give off a scent so they don’t eliminate odor by masking. We’ve been trying to market this product to the North American market. Ajay: Good. Let’s get to your questions. Tell me an issue where I can give you some tips on what to do. KB: Since the product is in a new product category, so to speak, because bamboo charcoal is not well-known to most people, and being a small company and a startup with very little marketing budget, how do we create the consumer awareness? Ajay: Because you have a small marketing budget, which by the way I think is a plus rather than minus for most of the startups; you are not going to blow it. The first thing I would say is you need to have a very clear idea of who your ideal customer is. That’s the most important thing; to know who your ideal customer is. Once you know the ideal customer, then you know normally where they will congregate. So because you have a low marketing budget, you can do two things. Either geographically, you limit if you are trying to go directly to the customers; or if you are doing digital, then you have a very narrow target because digital can reach a much wider geography. Digital allows you to reach a very wide geography but a very narrow focus on your customer. These days, most of the platforms will let you choose that market. So these are the two things. First thing I tell every business is you really need to know who your ideal customer is. Once you know your ideal customer, then you know where you can find them; either on the web or offline in the true geography. Once you know that, things become easy because you have a really low cost way of testing. First thing I always say is test it. With a very small budget, you can test the market of your ideal customers. Once they buy your product, you know their feedback. Hopefully, your product is great and then you solicit them to talk on social media about you, on the news, and everything. These days, anytime someone finds out about your product, the first thing they’re going to do is go on the web to find out about the company and about what other people are saying. That’s why I always say once you have ideal customers, you know they are going to like it, and once they are thrilled you start to build that base, and eventually it will have a snowball effect. Even when you are targeting a very narrow segment of the population, on digital marketing you can start with a very narrow geography, also; just in your area. So if there are problems, you can find out and contact them. Once you know that everything is working and your customers are buying your product and are really happy about it, then you start to open up to a much broader geography. That’s my suggestion go you: 1) Find your ideal customer; test your product with the marketing with a very narrow area so you are not blowing your budget; you are not spending a lot of money. Once you know that everything is successful, then you can start planning to scale. And even the scaling, I would do it gradually. If you are starting with your city, you can increase it to your state. And if the state starts working, you can start to go to neighboring states and ultimately, you can make it international. But again, before you start to spend a lot of money, you should know exactly what kind of return you are going to be getting. Say your budget starts with $1,000.00 a month. By the time you start to think about scaling, you should know that if $1,000.00 gives me $1,500.00 in return, then you test with $5,000.00. If it still gives you $7,500.00, then you test with $10,000.00. By the time you start to increase your market, you should really know what kind of return you’ll be getting. KB: At the same time, we have been featured in the media because different media companies have approached us. It’s not like we proactively looked for these opportunities; we can’t just get on ABC, like Good Morning America, just because we want to. These are opportunities that have come to us in the past few months. We got featured on Good Morning America back in October. KB: I was told, based on the report, there were over 4 million viewers that saw our product. Obviously, we would like to do that more often but once something like that happens, we are trying to just keep doing what we are doing and it’s different companies approach us at the same time after seeing us. I know what you mean by the snowball effect. But at the same time, it’s still hard to get the product in stores at this stage. I don’t know; it probably will take some more work on the branding, on the packaging. Ajay: Actually, I will tell you it is more about your customers and customers demanding it. Let me ask you a question. When you were featured on Good Morning America, did you see a spike in sales online? KB: Yes because they were running a sale. It was part of the “Deals and Steals.” They were running a sale. They built on my co-site to push the audience to the site so we got a lot of orders in two days. Ajay: That’s very good. Did you make profit on that? Ajay: Fantastic. Again, because you have a product that you are shipping, this is a great thing because even though they have 4 million, 10 million viewers, the people who came to buy should be matching your ideal customer. When you have lots of sales and you have the customer information, now what you can do is some further analysis with that list. KB: Yes, to match the email address. I can mirror a profile based on that, yes. Ajay: Correct, and market it. So you see every time you have a sale, you want to start to further narrow your target. Because you are a small business and it is always tempting, by the way, and I run into many small businesses as my clients who say “my product can be used by everyone.” Even though that is true, unquestionably you should start with a very narrow target because reaching everyone is very difficult. So yes, use that information that you already have. And now you know who your ideal customer is and who is buying it, when you get an offer to do it next time you just want to make sure that their audience is also consistent with who is buying your product. As a business owner it is very tempting to be featured on TV. But at some point if it is featured to the wrong audience, essentially yo have wasted your time and energy trying to get featured there, and it will not give you any benefit out of it. As you are selling, as you are getting customer lists, you should be using that to further assure that this is exactly the target customer that you are after. Ajay: One other question you asked was regarding the snail mail customer list. I will always tell you that everyone should be building a customer list. Someone who has purchased your product, and unfortunately I don’t know if Amazon.com lets you have that information; who has bought online. KB: Yes, I get that information but not the email address. I only get the physical mailing address. Ajay: By the way, there are many tools that you can use that information and it will generate the email address, if you want to test with email. One tool we have used in the past is called eGrabber. There it may make sense if you want to try an email campaign, which always works, you can use the eGrabber tool. You basically upload the list and it will go on the web and it will find the customer email address if you can’t find it. Ajay: Snail mail is still, believe it or not, very effective. My perspective on marketing is that it all depends on return on investment. So whatever channel you are using, I don’t see it as a good channel or a bad channel. I always get asked, “Should I be doing TV advertising or just, for example, digital marketing?” And I say both, if you are able to make money from both. It’s just a matter of tracking it very closely, any marketing that you do. If you are trying snail mail, again test it. Start with a small list, mail it to them and see what kind of result you get. If you are spending $100.00 and you are getting back $200.00 in profit, then you should do it all day. It’s just a matter of return on investment. Any method that you are doing, the testing is the most important piece I marketing. This is the biggest difference between big companies, and I have worked with some really massive companies with literally over $100 million in marketing budgets that I have managed; and very small companies that I meet and I talk to on a regular basis. The small companies, they don’t understand the testing. For example, if they are using snail mail, they will do a postcard campaign and just send it to 25,000 people in one shot. They are like, “Hey, I lost money.” Versus a large company will never do that. They will test with 1,000 or 2,000, whatever and they will not do a mass launch until they know what kind of return they can expect. Every time I have launched a marketing campaign, and I have been head of marketing also in corporations before, I had to justify to the management in terms of what kind of return I expect from it. It was never like, “Let’s launch this TV campaign that’s going to cost $3 million.” It was always, “This is the campaign and this is the return that I expect, and this is why.” I would have already tested it and made sure that everything's working before I would even go and present that idea. That’s what you want to do. Any marketing is fine. Make sure that you test with a very small budget. That’s why I was telling you that when you are a startup with not a ton of marketing budget, it’s a good thing. I have seen companies blow $50 million, $100 million, even $1 billion in funding just like that because they would go and blast it on TV and spend huge amounts of marketing dollars without testing it to make sure it would bring in the return. KB: I agree totally. That’s why I know if we invest our resources in digital marketing, in the past year or two just because we know that everything can be tracked and we test something in a small scale; we can track the results very accurately to see if it works or not. Ajay: Of course digital is very easy to track. But again, even traditional marketing, if you plan it right you should be able to track it. But digital is obviously trackable. One other piece of advice I will give you, by the way KB, is focus on one channel at a time. I see too many companies who say, “I’m also doing direct Maimonides, I’m doing some paid advertising; I’m also doing pre-targeted ads.” And my thing is that you should use it one channel at a time; maximize the return. Once you know that okay, I have literally saturated this channel; only then should you go to the next one. Again, the small businesses start to follow the large companies because they see that they are on TV, radio, internet and everywhere. They are there because they are not leaving any channel unsaturated. So you just want to make sure that the channels that you are using, you have maximized it before you try something else. In other words, if your digital marketing is already working, don’t even worry about snail mail until you know this is the maximum that you can get from digital marketing. Then, of course, look for other channels; look for the increases. So that’s good, KB. If you have any other questions, let me know [audio cuts out] [00:18:50] our discussion. KB: Awesome. Thank you, Ajay. This is great. Ajay: Okay, KB. Thank you.